Has Global Finance Reformed Itself More Than It Appears? What’s Wrong With Our System Of Global Trade And Finance? VPN Bone on Can you read me in China? Travel Solutions on Where are the largest gains from trade liberalization? sanny raskiny on Why Did So Many Cheer Turkey's Democracy While It Was Dying? sanny raskiny on How well did the Turkish economy do over the last decade? I don’t write a lot on Turkey these days. (My latest piece was published last September. It was on Erdogan’s missed opportunities to enter history books as a truly great leader, rather than the corrupt tyrant he seems destined for.) It’s partly because the subject is too depressing: try hard as I might, I really cannot find a good scenario developing over the years ahead. 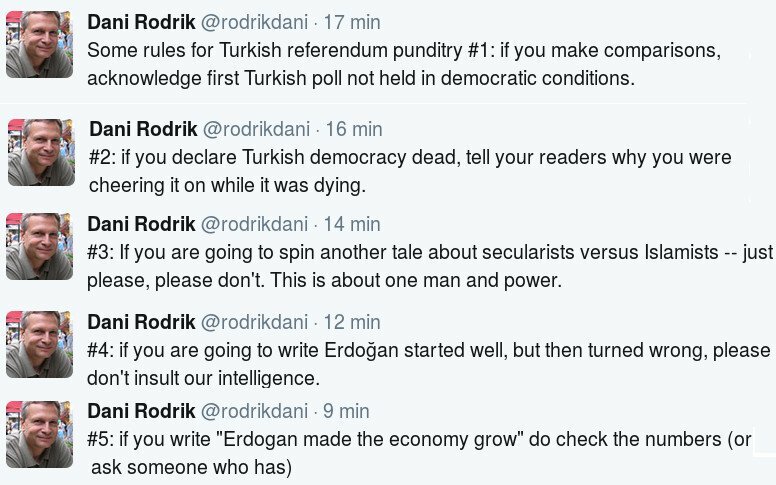 It’s also because conventional wisdom has so thoroughly converged on what I have been saying since I first began to write on Turkey’s politics in 2010. For a few years, I was a relatively lonely voice in a Western media landscape full of cheerleading for Erdogan and his then-allies, the Gulenists. (Sorry pundits, I wrote my “Turkey’s Democracy is Dead” piece seven years ago, back in June 2010!) I don't see much to be gained today by repeating what everyone else is saying about the abysmal state of Turkey’s democracy and rule of law. I do think a lot about Turkey, mostly about whether there was another path. Had the secular elite been more tolerant and opened up the political system earlier, might the religious-conservative backlash been avoided? Or, as many among those former elite argue these days, not without some justification, would the end simply have come sooner? Had the Gulenists not whipped up Erdogan into a frenzy of paranoia by concocting fictitious coup attempts, might he have eased up? What if the Gulenists had not been so intent on toppling him, once their alliance collapsed? What if the coup attempt, organized by Gulenists in all likelihood, had never taken place? What if Erdogan had not allowed the Gulenists so much power in the bureaucracy, judiciary, and police in the first place? What if France and Germany had provided a clear path to European membership soon after 2005? What if Kurdish fighters had nor restarted their military campaign against the Turkish state in the summer of 2015? What if there were real leaders within the AKP, not wannabes such as Gul, Davutoglu, or Arinc? What if the main opposition party was run by a charismatic leader who could connect with the masses? Erdogan is not a political Islamist or an Islamic ideologue. His own sensibilities and personal cultural orientation are Muslim for sure. But he is first and foremost a political opportunist. That is a good thing, because it means he knows when and how to lower political tension when needed and establish stability. Had he won the referendum with a comfortable margin, we might have consoled ourselves by thinking that the country would be moving into a calmer period. Erdogan might then have chosen to contest the next election for executive president – which will happen in 2019 latest -- as a unifier. But he lost all the major cities and may have needed some last minute skullduggery for the constitutional change to pass. So I do not see Erdogan easing up on his divisive rhetoric and policies anytime soon. Asked to predict Turkey’s future by a Turkish newspaper a while back, I said the country would end up looking like Malaysia at best and Afghanistan at worst. A liberal, secular path, with tolerance for diversity, civil liberties, and free speech no longer seems in the cards. That is still pretty much my prognosis. Like social science today, this piece too begins with the need to prove that this was predictable and indeed DANI had predicted it. In the middle there are a number of 'what ifs' all resting on the actions of the main parties in a sharply divided polity. What needs to be confronted tho is how Erdogan used a mix of populism and economic development to take things this far. Moreover prior to him economic policy lurched from sporadic development and crisis with many imf programs and various WB loans. What I would expect from DANI is a considered piece on where conventional economic policies and the IFIs might be leading us? What should be done differently. I write this from Pakistan where we love turkey. And our leaders are looking to Erdigan. I will not be surprised if they seek this direction in coming years. But clearly in Pakistan, democracy, conventional economics and IFIs have not been able to either deliver development or alleviate polarization of ideologies. It is extremely hard to say where things are going around in the world, as the France elections are too close to call, it will be really interesting with how things actually work out. So, it is very important that we trade through proper way and method; it is really what will help us with working well. I get plenty of support through OctaFX since they are licensed by FCA and got excellent reputation which helps me work smoothly all the time.